A child’s first encounter with science may be as a toddler catching lightening bugs in jars, followed up by taking apart and putting back together an old cell phone when he or she is older. But some children are spending more time in front of a television or computer and less time digging in the dirt at their neighborhood park or mixing kitchen chemicals, and they’re missing out on great opportunities to foster their curiosity and imagination. 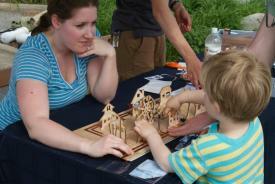 In an effort to renew that early interest in science in children, the Society for Science and the Public, in collaboration with the Gordon and Betty Moore Foundation, created the Science Play and Research Kit (SPARK) competition and challenged participants to reinvent the chemistry set of the 1940s – 1960s to create a new set of experiences and activities that encourage children’s interest in science. After lamenting with fellow parents on campus that toys that attempt to draw girls into engineering often seem weak and lacking, Jana Sebestik, of the Office for Mathematics, Science and Technology Education in the College of Education (MSTE) and MSTE’s Samantha Lindgren began brainstorming the criteria for a science and engineering toy that would appeal to both boys and girls. While some recent toys related to engineering have gotten great press, the actual products left Sebestik and her colleagues wanting more. After receiving an invite for the SPARK competition, Sebestik and Lindgren decided to develop a toy that introduces children to engineering and electricity systems. Sebestik and Lindgren determined their ideal science and engineering toy would have easy access out of the box to allow children to play with it immediately and that it wouldn’t have a correct or prescribed way of playing, so that the play encourages exploration. Additionally, they wanted the toy to include many pieces to foster creativity for sustained play and for multiple encounters, along with being gender neutral and fun. They developed Power Park, which was inspired by electrically wired dollhouses and green technology, to meet all their criteria for an outstanding science toy. 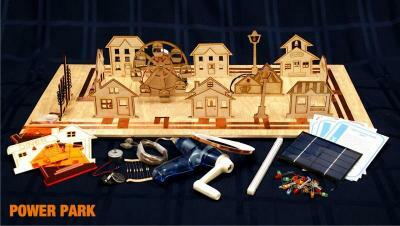 Power Park allows aspiring power engineers and urban planners to design and power a neighborhood filled with homes, a school, substations, shops, a diner, gazebo, and even a moving Ferris wheel. The village pieces fit into a wooden base with exposed conductive copper tape circuitry that allows for a variety of configurations. Some of the buildings come wired with LED lights, but children can use their imaginations to create new set ups. The Power Park set also comes with a solar panel, batteries, a hand crank generator, extra buildings, copper tape, and assorted LEDs, with the option of adding more features in the future. 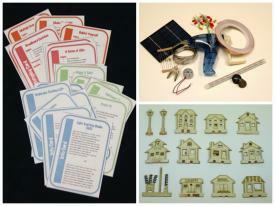 Included in Power Park are sets of info, task, challenge and prototyping cards that offer more directed play, as well as extra copper tape, LEDs, additional buildings and more to allow for extended play. Developing the game was a team effort, with Sebestik and Lindgren utilizing the help of undergraduates Sufei Zhang and Brendan McDonnell to help design, build, and troubleshoot the model. Zhang, a math major, was in charge of drawing the pieces of the model, choosing the materials and using a laser cutter at the CU Community Fab Lab to create the pieces, while McDonnell, an engineering mechanics major, helped finalize and troubleshoot the toy. Four sets of color coded cards (Info, Task, Challenge and Prototyping) are numbered in order of increasing complexity, and are included with each set to offer more structured and directed play for the child who craves a problem to solve. “We didn’t want to just tell the kids what to do, but wanted them to figure it out, so the cards guide you in that direction, but allow you to make mistakes and learn from those mistakes,” McDonnell said. While winning the SPARK competition would come with a $50,000 award, Sebestik and Lindgren plan to pursue further funding whether they win or not. Additional funding would allow for more field-testing, advanced prototypes, and further large-scale development and production of this toy that they feel fills an important gap in today’s science and technology market for children at home and in school. Both Zhang and McDonnell expressed that they wished they had toys like this when they were younger to help them and classmates engage and get interested in science. Zhang and Sebestik added that toys like this show that circuits, and other science and technology related topics, aren’t as complicated as people may think, and that a toy like Power Park is a great visual way to explain an abstract concept.